Lavender and Mint not only add nuance and flavor but also plant chemicals called terpenoids that offer cell protection and enhance digestive function. Blend your favorite summer fruits including richly colored berries filles with anthocyanadins and phytophenols which are super antioxidants. 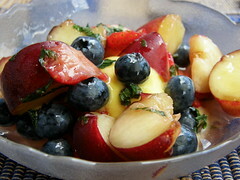 Toss with fresh or dried lavendar flowers and sprigs of fresh mint and lime juice along with a dash of salt and fresh ground black pepper for a refreshing summer fruit salad. Combine honey, 1/3 cup water, lavender, pepper, and salt in a small saucepan. Bring to a simmer over medium heat, stirring until honey has dissolved. Remove from heat, and cover; let steep 10–15 minutes or until room temperature. Strain into a serving bowl; discard lavender and stir in lime juice. Add peach, nectarine, and plum slices to honey mixture, and toss well. Add berries and mint, and toss gently to combine. Refrigerate 1 hour or until chilled. Serve.